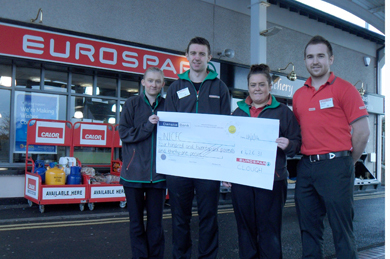 STAFF of local supermarkets at EUROSPAR Drumaness and Clough are celebrating the success of their Christmas fundraising for local children’s charity, Northern Ireland Cancer Fund for Children (NICFC). The Drumaness and Clough teams raised a grand total of £310 and £426.31 respectfully by encouraging their customers to donate their spare change to Make A Change to the lives of local children, teenagers and young people living with cancer in Northern Ireland. Sorcha Chipperfield, Corporate Fundraiser for NICFC, extended the charities thanks to the staff and customers of EUROSPAR Drumaness, She said: “Christmas is a wonderful time of year for many families, but for some local families affected by childhood cancer, it can be a frightening and stressful time as cancer steals family days together, replacing them with visits to hospital, greulling treatment and unanswerable questions about the future. The Clough Eurospar team: from left, Simon Herron, Natasha Murphy, Ciara Kelly and Graham McKee. NICFC is due to open their new therapeutic short break facility, Daisy Lodge in the coming months in Newcastle. Nestled in the foothills of the Mourne Mountains, Daisy Lodge will provide 500 families a year with a short break, allowing them to relax, recharge their batteries after treatment, and build lasting family memories. 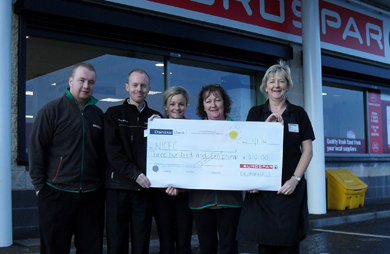 EUROSPAR’s across Northern Ireland have been fundraising for NICFC as their official charity since 2011, and together the partnership has raised nearly £300,000 to support the cause.